Two Thousand Trees isn’t exactly the festival on the tips of everyone’s tongues, to mention you’re attending would usually lead to questions of what and where The answer to that if your still wondering, is a farm six miles outside of Cheltenham where 2500 music lovers travel to camp for two days of alternative music. The festival is in its fourth year and this outing boasted easily its best line-up so far, with some of the best up and coming bands the UK has to offer. With many people arriving on the Friday morning, once through the gates it was a mad rush to get unpacked, put your tent up and with a cider in hand make your way down to the mainstage where Crazy Arm (4/5) were second on. The set was high in energy and luckily pulled quite a large crowd who had managed to erect their tents just in time to make it down for a band that are creating quite a name for themselves, and there’s no doubt that their set clawed in a few more. Tubelord (3.5/5) were up next with their take on dipping into a plethora of genres, with their mathy rhythms and post-punk mayhem. Each track builds and sways in every direction, and when everything comes together your left in awe of their outbursts and ability to deliver quiet whispers then without warning erupt into madness. The only questionable factor is the vocals that at times feel strained and out of place. And So I Watch You From Afar (5/5) were up next and are simply an outstanding live band, the crowd begun quite small but by the end of their set it had tripled in size. These four musicians are each masters of their trade, mixing intricate and delicate moments with deafening attacks, once the onslaught was over people simply looked around at each other in shock. Shouts of ‘best live band in the world’, although clearly exaggerated, for a minute was probably agreed upon by the sweaty bodies in attendance. The Xcerts (3/5) probably felt quite unlucky at this point, trying to follow up a performance from ASIWYFA that can only be described as out of this world. But these three lads gave it all they had and looked to be enjoying themselves up on stage, putting on beaming smiles and some great pop rock. Pulled Apart By Horses (4/5) brought the first display of absolute mayhem from the crowd, who had yet to really fully let loose. A pit opened up and at various times turned into a circle pit that saw one sorry soul dislocate his knee, luckily enough this was near the end so he was able to escape and make his way into the back of an ambulance. To say the set was high energy would be like describing England winning the World Cup as ‘nice’. They put every last piece of energy they had into attacking their instruments, and its surprising lead singer Tom Hudson even had a throat afterwards. Frank Turner (5/5) marked his first ever time headlining a festival, and he was eager to apologise for missing last year as he’s usually a regular, playing the past two years before. 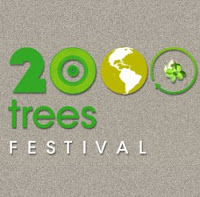 Due to his personal relationship with 2000trees it felt like an old friend had come back home. The crowd was at capacity but somehow a feeling of intimacy was created for the hour and thirty minutes that he played. ‘The Real Damage’ begun the set that spanned all his albums, with even an appearance from ‘Campfire Punk Rock’ in the form of ‘Nashville Tennessee’. Every single song was sung back to him twice as loud; even the surprising inclusion of a new track got a great reception. The set-list was masterly crafted to cater for fans old and new, and even his great cover of The Lemonheads classic ‘Outdoor Type’ made its way in. The night then ended with a classic sing-a-long from fan favourite ‘The Ballad Of Me And My Friends’. He has been bringing his sound to bigger and bigger stages throughout the past two years, and this performance shows why he deserves the success he is having, thoroughly enjoyed by every member of the crowd and only hindered by the fact that he couldn’t carry on all night. The last day of music came upon everyone too soon, but it was clear they all wanted to make the most of it, especially as the sun made an appearance for nearly a whole day, meaning a lot of that local favourite Badgers Bottom cider was consumed to quench the thirst of the hot and sweaty crowds. Twin Atlantic (4/5) gave a performance with all the classic moments a festival set gives you through a mixture of well-crafted songs, friendly Scottish wit, and a fluffy turtle called Lucinda who sadly tumbled eight feet into the pit. The set was riddled with guitar issues and obvious comparisons with another Scottish trio will flood in, however all this was forgotten as a cameo from a brilliant man in a chicken suit gave them a fitting animal-themed 2000 trees ending. 65DaysOfStatic (5/5) “we will not retreat, this band is unstoppable”, was a fitting opening gambit from one of the festivals most anticipated bands, and one that cannot be disputed. 65DaysOfStatic’s surprising choice to open with the classic ‘Retreat, Retreat’, was enough to send the crowd into instant delirium and what followed was exactly the kind of indescribable mayhem that we’ve come to love and expect from Sheffield’s finest outfit. They say time flies when you’re having fun and although they did go into ‘We Were Exploding Anyway’ outro, ‘Tiger Girl’ a tad too soon due to delays earlier in the day. Everyone was so lost in the moment it really didn’t matter. The sound is so dense and delivered with such passion, something you have to see live, and you would be a fool not to. The Leaf Lounge stage seemed to be packed out all weekend, with an array of different performances and most notably Vessels (4/5). With their post-rock instrumental onslaught that brought a gem of a performance. The sound is huge, helped mostly by the three guitarists who make sounds that are monstrous; leaving the audience hanging on every note as they dropped from sheer epicness to delicate nothing. A great performance by a band that is incredibly understated, making it even more special. 60 bands played over the two days, spanning many genres and a huge array of folk acts over three stages. At its core this festival is testament to the talent here in the UK, proving so successfully that to create a festival you don’t need to rush overseas for performers. The atmosphere is unlike any other, the food is good, the people are friendly and it’s all done using renewable energies making it the greenest festival around. The fact that so many great bands were drafted in for only the fourth year just proves that it’s something special. Independent festivals should always be supported, especially if like 2000 trees they are done right. Its organisation, atmosphere and showcase of talent are second to none, and I havn't even mentioned the impressive Three Trapped Tigers, the crowd surfing alligators and Frank Turner coming on to beat-box with Beans On Toast. If there is one thing you do within the next week, it should be to buy a ticket for 2011 and with the bands that 2010 saw, it’s clear that the line-up will only get better and better.